The historic township of Malmsbury (Victoria, Australia) grew from a travellers' stop, on the banks of the Coliban River, on the road from Melbourne to the Mount Alexander Goldfields (Castlemaine District) in the 1850s. Travellers would stop and camp at the river to await a safe crossing. The headstation of Alexander Fullerton Mollison's Colliban pastoral run (1837) was on the west side of the Coliban. With the discovery of gold in Victoria and the need to open up the land for freehold purchase, the run was surveyed and large portions offered for sale which greatly reduced its size. Two early features of the town were a hotel and the Caroline Chisholm Shelter Shed, one of only 10 built in Victoria to offer safe and affordable accommodation for travellers, especially women and children, to and from the goldfields. CLOSED EARLY DECEMEBR TO EARLY FEB UNLESS A PRIOR APPONTMENT HAS BEEN MADE. CLOSED ALL TOTAL FIRE BAN DAYS. Eventually Malmsbury became a gold town itself, but it is also famous for its bluestone rock which has been used to construct many a historic building. Not only is the local railway viaduct and station built with it, but many buildings in Melbourne, including Parliament House, feature the local stone. The Malmsbury Mechanics Institute, built in the 1870s and extended in 1895, is another historic building in the town, and is the home of the Malmsbury Historical Society. 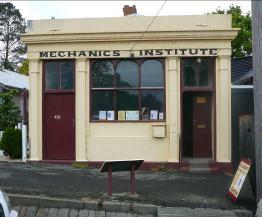 The Mechanics Institute movement was the forerunner to today's public library system and often provided meeting places and events for all levels of local communities with the aim of self-improvement. Our motto is We Serve to Preserve and through our records, research and exhibitions we keep alive the history of Malmsbury and district. Our areas of interest are Malmsbury, Drummond, Denver (formerly known as Burke), Edgecombe, George Town (between Malmsbury and Taradale) and Green Hill. Drummond and Denver are located in Hepburn Shire (part of the former Glenlyon Shire) and rate records are held at Daylesford Historical Society. The Kyneton newspapers, however, frequently reported events at Drummond. Drummond births were often registered in Malmsbury (or Glenlyon) and many former Drummond residents are buried at Malmsbury, Glenlyon and Spring Hill Cemeteries. Malmsbury, Drummond and Lauriston were both in the Taradale division of the Castlemaine Mining District, rather than the Daylesford Division. Malmsbury Historical Society will be open on Friday the 14th and all DAY Sunday 17th Nov.
We also have a wide range of secondhand history books for sale which cover Australian, Victorian and Local history, family history, and European , Natural and general history, craft and children's and adult fiction. Collectibles include Tuckfields Teas bird cards, stamps, phonecards and Victoria public transport tickets. Link to a list of second-hand books which will be available for sale (some may have already been sold). Our petition is now closed (September 2015) Thank you for your support.